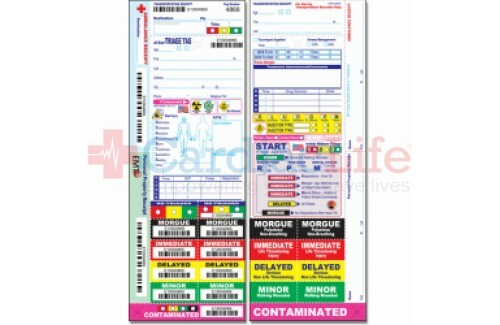 New larger more detailed transportation receipt, ambulance receipt, and downward triage capability. First responders are facing challenges never before imagined. The once unthinkable threat of radiological, biological or chemical contamination of our civilian population is now a reality. To successfully manage these incidents new strategies and tactics must be developed. 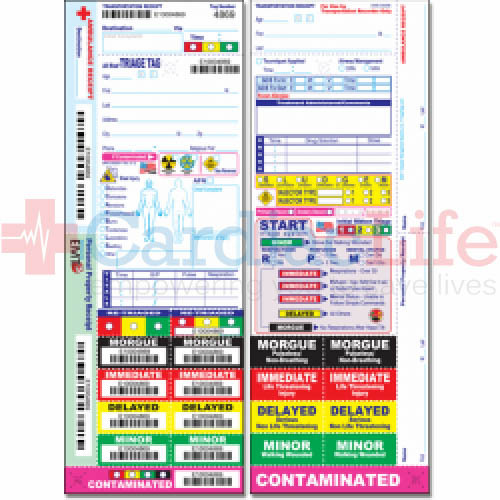 The triage tag developed by Disaster Management Systems provides first responders with a tool to identify, process, and triage contaminated patients. The tag also provides rescue personnel with a means to tag and identify clothing and other personal property. Tagging of evidence in the form of clothing and personal effects will aid law enforcement in their investigation.